Rest easy for now: we’re pretty far from actual Terminator robots. Boston Dynamics has just about got the walking part figured out (edit: Ok, you can worry, it does backflips now)–but we’re still pretty far from the able-to-ride-a-motorcycle-down-the-spillways-in-LA part. Real talk: like in the case of the stock market, though, the fear of AI isn’t unfounded. And despite hyperbolic “science” journalism, a lot of smart people, like Bill Gates and Stephen Hawking, agree we should be paying close attention. A couple guys in particular–Eric Horvitz, the director of Microsoft Research’s main lab in Redmond, and the president of AAAI, Thomas Dietterich–wrote an article about tangible, scary consequences of prolific AI use. It’s one of the best I’ve seen on the actual, technical risks posed by AI, and incredibly well written. They talk about criminals using it, the effects of unforseen emergent properties, and just plain old programming bugs. They even talk about how how AI is at least one of a number of significant forces behind shifts away from Pareto’s comfy spot in wealth distribution over the last two decades. Metropolis, anyone? 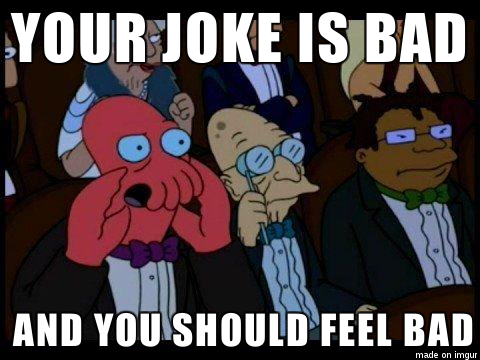 How I feel about this blog most of the time. AI has always been scary. It’s been scary since Frankenstein. It’s been scary since John Henry. It’s just that now Frankenstein’s monster got a cybernetic upgrade. Our fear of AI combines two of our greatest fears: our fear of the unknown and our fear of being replaced. Anyone remember learning about the “uncanny valley” in English? It comes from old school Gothic literature: when the author wanted to spook you they’d omit describing the spooky thing. Mary Shelley never tells you what Frankenstein’s monster looks like. Oscar Wilde was pretty scant with Dorian Gray’s portrait–I mean, how ugly could his dead self have been? Dr. Jekyll and Mr. Hyde, 2spooky4me. The common thread which carries into most modern scary story telling today is playing off of people’s fear of the unknown by purposefully obscuring tangible details–letting our imaginations subconsciously fill the gaps with paranoia and what-if’s. Uncanny things: people who photoshop Nicolas Cage’s face onto everything. Everyday this creeps into our uncanny experiences with AI, when Watson holds a conversation with Alex Trebek and Amazon files a patent for delivering stuff to you before you knew you wanted it. But it’s not quite human. It doesn’t jive with our mental model of the world. It causes us to step back and say “that’s weird”. One of my favorite examples of the uncanny in art today is how the animators of Attack on Titan draw the people-eating giants. 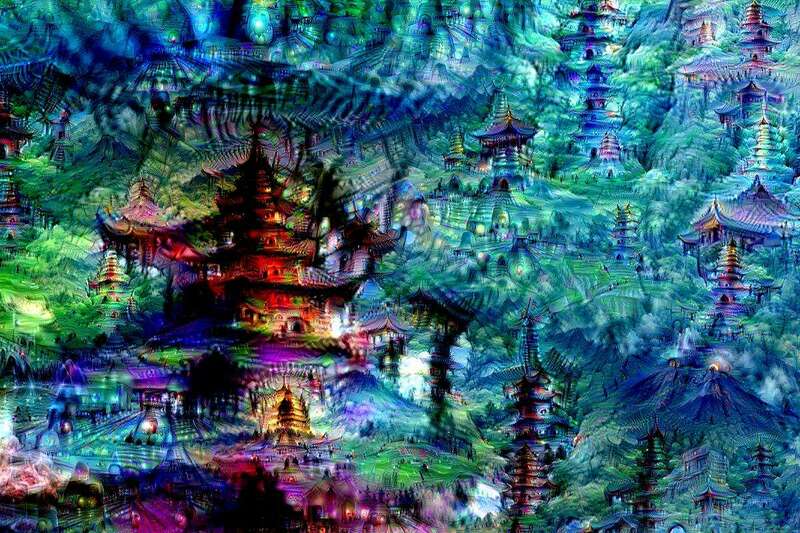 Or Google Dream’s reconstructed images–the mental map of an image processing AI. It’s weird, dude. AI does that to us with ease, and Hollywood takes it to the bank with machines inhabited by Johnny Depp freed from Tim Burton’s obsession with him. Johnny getting that uncanny feeling about his role in “Transcendence” where AI ruins everything of course. But what AI does that Frankenstein’s monster never could, apart from monster mashing, is trivializing the human experience. It threatens us with the fear of being so easily replaced. Around the turn of the 20th century, the industrial revolution was in full stride. JP Morgan was putting on the ritz and machines were replacing craftsmen. Cameras were replacing painters. The iron horse was replacing… well, the horse. The tale of John Henry encapsulated this battle between man and machine. John Henry was the Tiger Woods of drilling holes for explosive tunnel digging. One day a steam engine comes along to outshoot his 5 under par. Our boy John Henry beats the machine, but at the cost of working himself to death. The allegory has been hitting close to home for a long time: robots replace people on the factory floor. Not too long from now, automated cars will probably replace taxi drivers. People, for good reason, resent being replaced by a machine, but society eventually grows around the machine and benefits as a whole. This epic struggle between man and machine was pretty dope in The Matrix with all that kung-fu, but as the story unfolds, it’s clear the dependence on one another forms an endless cycle that Keanu Reeves will never escape. AI easily combines these two fears considered fundamental to the human experience in ways that we never could have imagined 200 years ago. It trivializes us, and we don’t even really know how. But from Frankenstein’s monster came the Adam’s family (*snap*, *snap*). And from John Henry battling the machine? Well now we battle with machines in monster truck rallies, which is pretty sick. I wonder what the sitcom version of Skynet will be like. Those robots from Interstellar were pretty funny.